Late this morning, I spoke with Rosie Hanes of Robert Hanes construction. 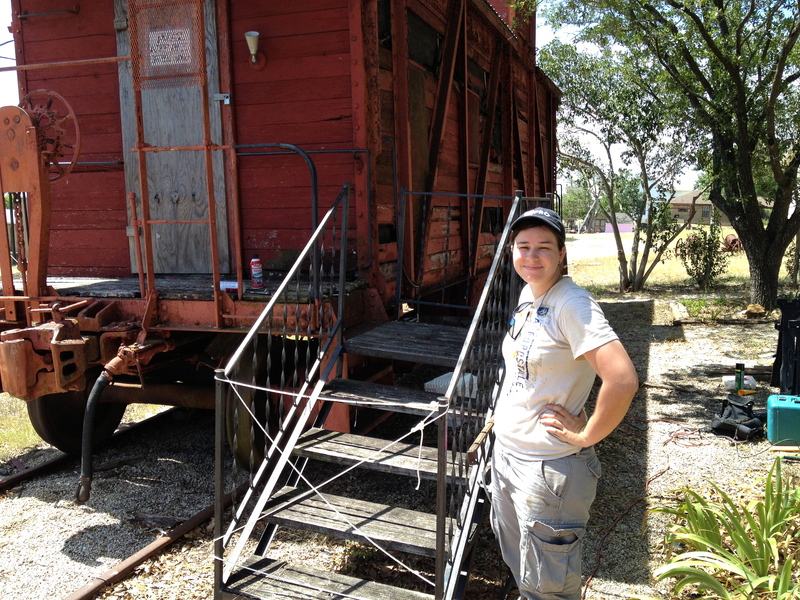 They are replacing the wood on the steps and the platform of the historic caboose, which sits by the Coupland Depot Museum. She expects that the new material will be installed today and painted tomorrow. This is Phase One of the restoration, which was necessary for reasons of safety since so many people were standing on the caboose for portraits. If you want to help make the complete restoration happen, plan to attend Choo-choo Fest 2013 on August 11 at the Old Coupland Dancehall & Tavern! Get more information on the Coupland Civic Organization website. This entry was posted in Breaking News, What's New?, WHO is That? and tagged caboose restoration, Choo-Choo Fest, Coupland Civic Organization, Robert Hanes Construction on July 11, 2013 by Stewart Dale Spencer.